DAYTON, Ohio (September 18, 2018) ― Activated Spaces is now accepting applications for the Activated Office project. This new program focuses on refreshing empty office space and providing entrepreneurs an opportunity to test out downtown as their business address. Activated Office builds on the success of the Pop-Up Shop Project, which was launched in 2011 to activate first floor storefronts. Selected Activated Office tenants will receive a short-term lease option for downtown office space, a small stipend to help offset startup costs, and a below-market lease rate. In addition, each selected business will receive 10 hours of free legal services from Pickrel, Schaeffer & Ebeling, and 15 hours of free marketing support from either Catapult Creative or Creative Fuse. 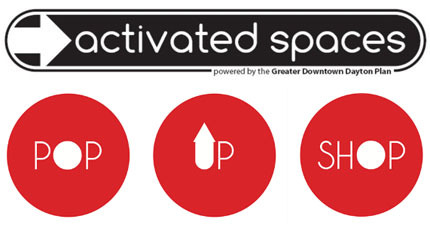 Interested business owners should fill out an application, which can be done online at www.activatedspaces.org, or downloaded and emailed to Jen Cadieux at cadieux@downtowndayton.org. The application deadline is 5 p.m. Friday, October 12. The Activated Office project will host up to three companies in recently renovated space on the eighth floor of Liberty Tower (120 W. Second St.). The Activated Spaces team has partnered with the ownership at Liberty Tower to remodel a traditional office suite into an open, non-traditional, collaborative space. Started in 2011, the Activated Spaces, Pop Up Shop Project has launched 26 new businesses (17 of which stayed open past their initial pop up period), filled approximately 25,000 square feet of previously vacant space, and created 42 jobs. As this program continues to celebrate success, volunteers looked at other ways to continue to support downtown’s revitalization. Thus far, Activated Spaces has been focused on activating first-floor retail space by providing tenants with a short-term lease and below-market value lease rates. Now the program will also activate office space through a shared office model. Since 2011, more than 120 startups have launched downtown. Several recent initiatives and projects are building on this momentum, including Start Downtown, Dayton Startup Week, the plans for the Dayton Arcade, and partnerships between The Entrepreneurs Center, the Air Force Research Lab, and the Wright Brothers Institute. The Activated Office project is envisioned as another resource that will help provide a supportive environment for the growing downtown startup community.